Back in the 30’s we could already find Bartolo Giner taking the people of Benissa to the train station or to the doctor’s in his taxi. Later on, his sons Andrés and Manuel joined in and, in that way, the small, family business was created. 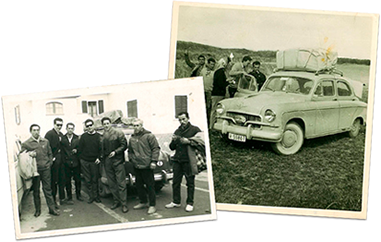 In 1967, the brothers, motivated by the boom in tourism that had reached our municipality, ventured out by buying five Seat 600 and a Seat 1400 to create a ‘’Rent a car’’. With a lot of dedication, they managed to get ahead and increase the fleet every year until reaching today’s fleet with nearly 300 vehicles. 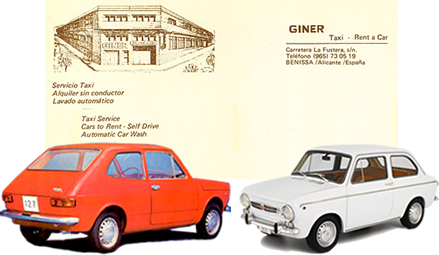 The relationship between the Giner family and motor vehicles goes back a long way. Back in the 30’s and continuing a tradition that came from previous generations, we could find Bartolomé Giner Cabrera taking the people of Benissa in his ancient taxi to the train station, to the doctor’s and other places which, due to the lack of means of locomotion at that time, were nearly inaccessible. Later on, his sons Andrés and Manuel joined in and, in that way, the small, family business was created. With the passing of the years, the workload increased and changed in nature. 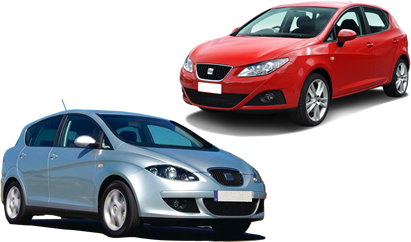 The evolution of the vehicles and improvements to the road networks greatly contributed to that. 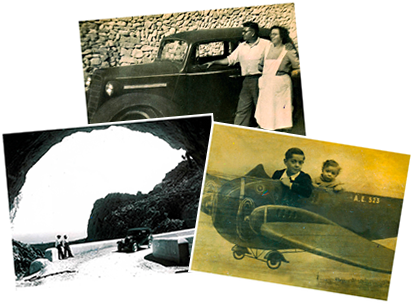 The difficult living conditions that prevailed at the start of the 60’s led many people from Benissa to seek their fortune beyond our frontiers, making frequent trips to France and, above all, to Switzerland. And it is precisely there where the long Giner relationship with other countries began. But it wasn’t until 1967 when the brothers, motivated by the boom in emerging tourism that had reached our municipality seeking the sun and tranquillity of our coasts, ventured out by buying five Seat 600 and a Seat 1400 to create the first “Rent a car”, an unknown word at the time that was just an Anglo-Saxon abbreviation of “Renting of vehicles without a driver”. 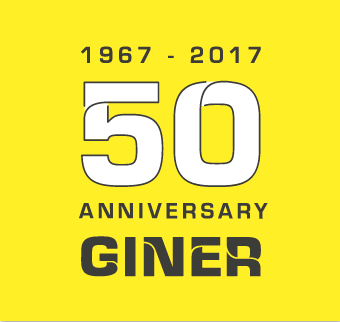 Bartolomé Giner’s reaction is conceivable and understandable when his two enterprising sons got him involved in their innovative ideas: "You are crazy! How are you going to give a car that costs a fortune to someone you don’t know at all?" 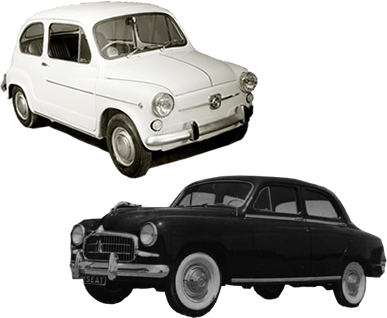 The Seat 850 and Seat 127 models are added. The company’s first logo is used and the company moves from “uncle Bartolo’s” house in the village to Carretera La Fustera, which was on the outskirts. Construction of the building was started. 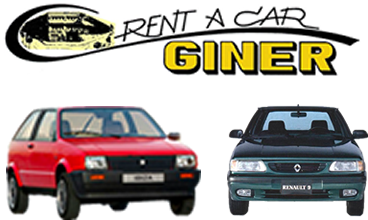 Incidentally, the logo was taken from one of the sketches that an architect, a friend of the family, proposed to the brothers for the construction of a building that would later become the offices and garages of Rent a car Giner. It so happens that the chosen sketch coincided completely with the edification that was totally finished a few years later. The 2nd generation starts to enter, the logo is renewed, the fleet reaches 200 cars and publicity is used on the vehicles for the first time. With a lot of sacrifice and, above all, a lot of dedication, they managed to get ahead and increase the fleet, bit by bit, every year until reaching today’s fleet with nearly 300 vehicles. The fact that the brothers have been around motor vehicles practically all of their lives kindled their early passion for old cars and, even today, they still have the collection that they managed to build up throughout the years, both real cars and miniature models. 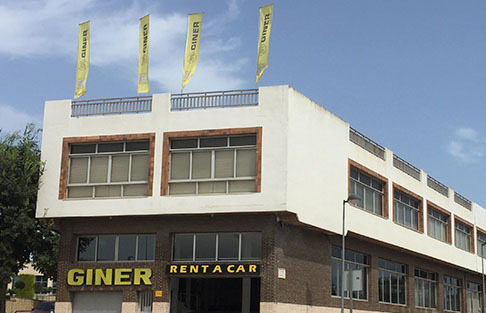 50 years renting cars and, during this time, 25.000 customers with over 50 different nationalities from the 5 continents have come through our offices. We have celebrated this important milestone by completely renewing our image and our webpage.